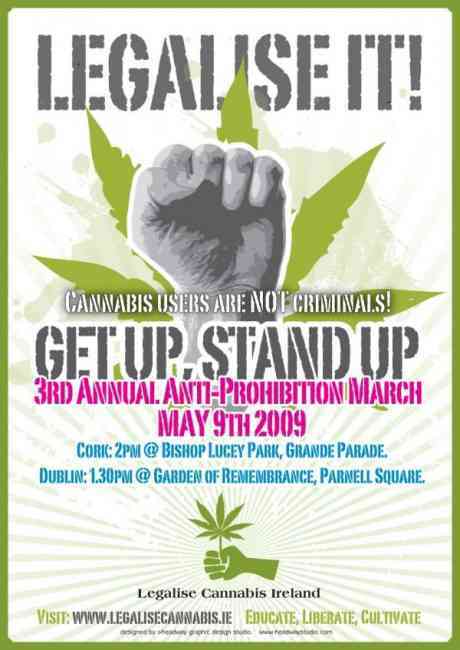 3rd Annual Anti-Prohibition of Cannabis March - Dublin and Cork! Legalise Cannabis! -Cannabis users are NOT criminals! Join us in the fight to legalise the world's most popular illegal plant. 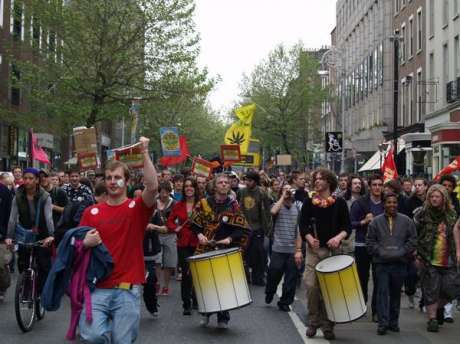 Legalise Cannabis Ireland was founded almost two and a half ago following several years of sporadic attempts at highlighting the fallacy that is the prohibition of cannabis. Prior to this, virtually the only public cannabis actions were J-Days - annual mass smoke-ups in a park. A few had taken place in Dublin but following an initial flourish, attendances dwindled. Only a small crowd assembled in 2006 at the aptly named Marlay Park. This gathering was interrupted by a nasty bunch of Gardai who proceeded to demand all kinds of silly information from the innocent afternoon tokers, some of whom were arrested. Following from this it was felt that a more coherent strategy was necessary in order to bring the issue into the public domain and to stimulate meaningful debate. Many of those involved felt that having a tokenistic (!) smoke-up in the park once a year just wasn’t going to alter in any meaningful way the current situation in relation to cannabis or the many problems that prohibition is causing Irish cannabis enthusiasts. With that in mind, the decision was taken to organise the first ever Anti-Prohibition march on these shores, to be held the 6th of May 2007, the same weekend as the Worldwide Marijuana March across the rest of the globe. With that, the wheels began to turn on the wagon of a new movement, eventually to be christened Legalise Cannabis Ireland. An interesting mix of people came together to take on the donkey-work of getting a campaign up and running A healthy concoction of experience, nationality and gender proved productive as the ideas began to flow. 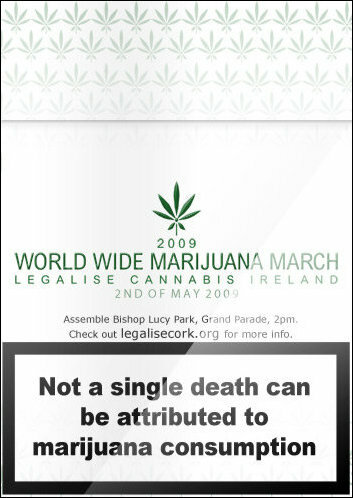 With the help of supportive Head/Hemp/Grow Stores, the campaign produced a number of well-designed, informative and accessible leaflets on topics such as medicinal use, the problems caused by prohibition, and the scourge of contaminated cannabis - a problem of particularly great magnitude in Ireland. Pot can help tackle the Recession!! The Irish government estimates that there are 300,000 cannabis smokers in this country, around 10% of the adult population.. The government spends around €200 million every year to prosecute less than 1% of those smokers and intercept less than 10% of the incoming narcotics. If the war against cannabis users were to be won, it would require an annual spend of over €24 billion - more than the entire annual tax take. Simply removing cannabis from the law enforcement priorities of the state would produce massive savings. The Justice Department would save €109 million per year: the savings for the Gardai alone would be â‚¬58.8 million every year. Besides saving money, ending the unjust war on cannabis would free up resources and manpower to fight serious crime. If the government decided to regulate cannabis sales, this could be expected to bring in over €200 million in VAT on Irish cannabis sales alone. Regulation of the cannabis industry would result in the creation of hundreds of jobs. It would generate an estimated €243.8 million per year in employer taxes, and a further €26.3 million in PAYE taxes. The Netherlands generates an estimated €360 million per year from tourists visiting their cannabis vending coffeeshops; Ireland could expect to generate up to 80% of this revenue from tourism. Widespread cannabis contamination and lack of quality control regulation is costing young people their respiratory health and creating an unknown future burden on the health services. Cannabis smokers are consuming plastic, glass, lead, diesel and various other dangerous additives designed to increase weight and market value. Cannabis legalisation would deprive violent criminals their share of the illicit market and would net the Irish state a total of over €879 million per year. Shoudl eb fun,music,colour and a clebration of cannabis. 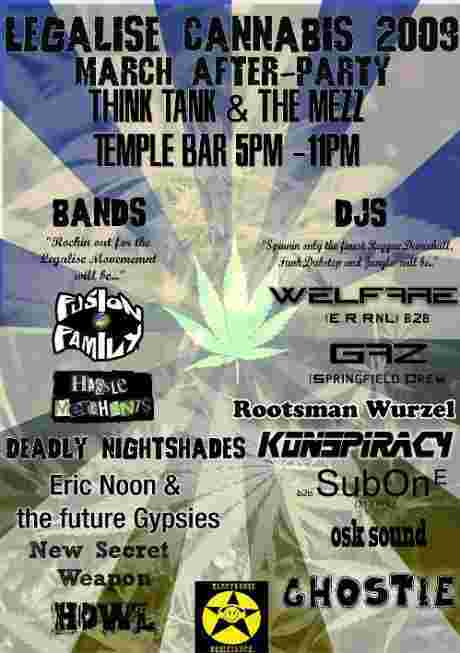 Great lineup of bands and DJs in Eamon Dorans afterwards until very late in the eve! MARCH -With music and colour! AFTERPARTY - Get down and boogie! 5 BANDS - Reggae,Funk,Acoustic,Rock and more.. 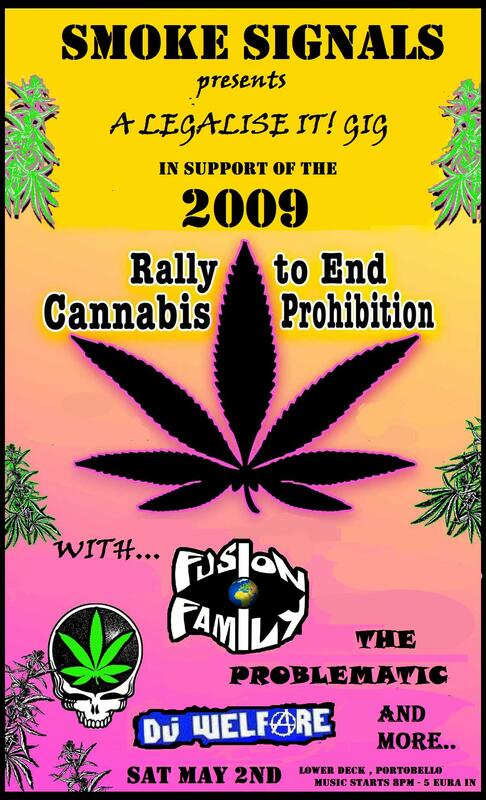 Lets protest the prohibition and celebrate cannabis!